Ms. Reine Rimón is one of the few jazz vocalists in Europe with a repertoire consisting solely of traditional New Orleans style jazz. Ms. Rimón is also the only singer in Finland devoted only to this music genre, and the only one performing regularly with professional New Orleans musicians in Europe and the U.S.A.
New Orleans awarded Ms. Rimón with a Certificate of Merit for her long-time efforts to promote the traditional New Orleans jazz music and musicians to the European audience. the famous Preservation Hall in New Orleans. 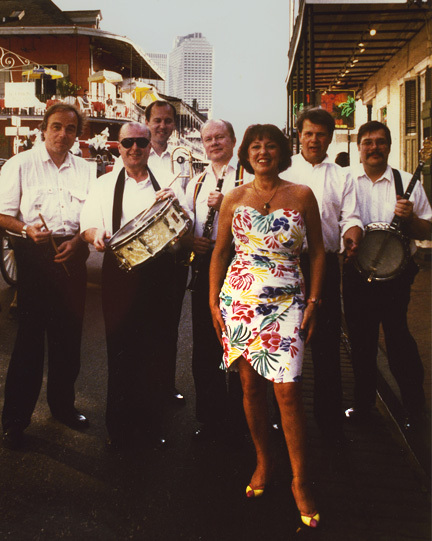 Reine Rimón & Her Hot Papas in New Orleans, Bourbon Street, 1996. Since the early 1980's, Ms. Rimón has visited New Orleans regularly. She has performed at the New Orleans Jazz & Heritage Festival - the major world event of traditional jazz which averaged an audience of 400,000 people before the devastation caused by hurricane Katrina and the Bush government. Ms. Rimón's references in New Orleans include the Storyville Jazz Hall, the Mahogany Hall, the Maison Bourbon, the Fritzel's, the Norwegian Seamens' Church, and the New Orleans Country Club. Gregg Stafford, Wallace Davenport, Wendell Brunious, Leroy Jones, Michael White, David Grillier, Jacques Gauthé, Sadie Colar, Walter Louis, Chester Zardis, Frank Fields, Richard Payne, Walter Payton, Ernest Elly, Walter Payton and bands like Steve Pistorious & His Mahogany Hall Stompers and Stanley Stephens & His Hot Five. In 1986, she recorded in New Orleans an album with her own band and Gregg Stafford, Michael White and the late Stanley Stephens (504 LPS 15); in all, Ms. Rimón has released eight recordings between 1963 and 2007. In Europe, Ms. Rimón has performed at all the major jazz fests in Finland, and at several major events in Sweden, Estonia, Germany, Greece, Italy, Switzerland, Russia, and the Netherlands.